Rough chop onion, bok choys, and Lacinato kale (also called dinosaur kale). Just chop kale and baby bok choy down to the bottom of the leaves. Heat olive oil in pan, add vegetables and stir-fry until crisp tender. Sprinkle with balsamic vinegar and maple syrup and stir in. Add salt and pepper to taste. Cook about 5 more minutes. 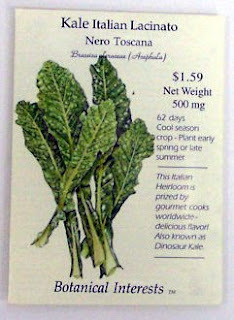 Here is a picture of Lacinato kale - I think it stir-fries better than the other types and isn't bitter at all. I don't think I have had this type of Kale, will have to look for it. Sounds yummy. I love my greens.